Whittaker & Co. (1886-1892) 5 inch plate "Hey Diddle Diddle"
I have always loved nursery rhymes. 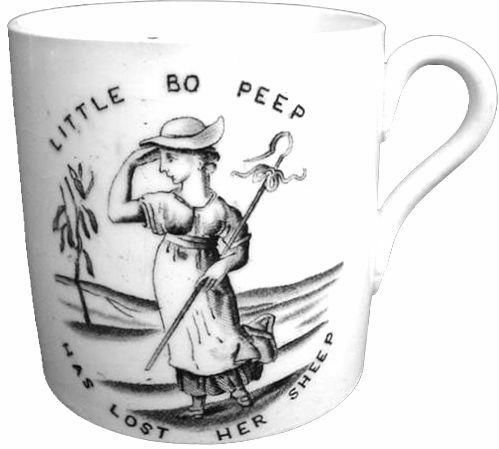 Mary Had A Little Lamb, Little Bo Peep, Jack And Jill, Little Miss Muffet, and many more have remained with me from childhood. 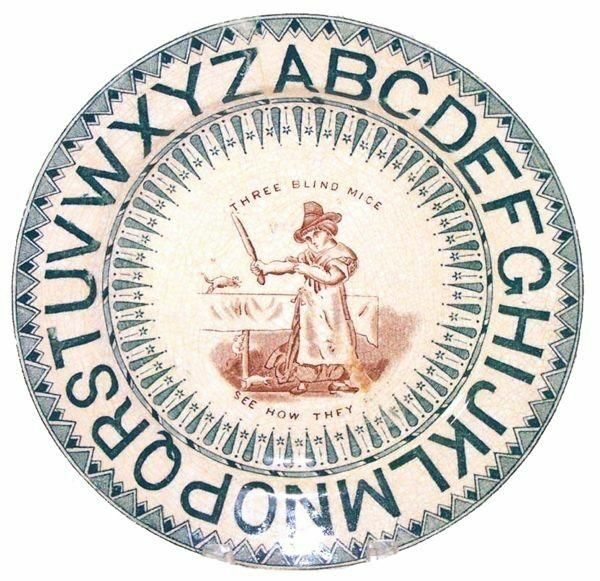 I learned a lot from them; it is sometimes okay to break the rules, things usually work out, sometimes you fall down, and fear of spiders! Nursery rhymes have been popular for hundreds of years. 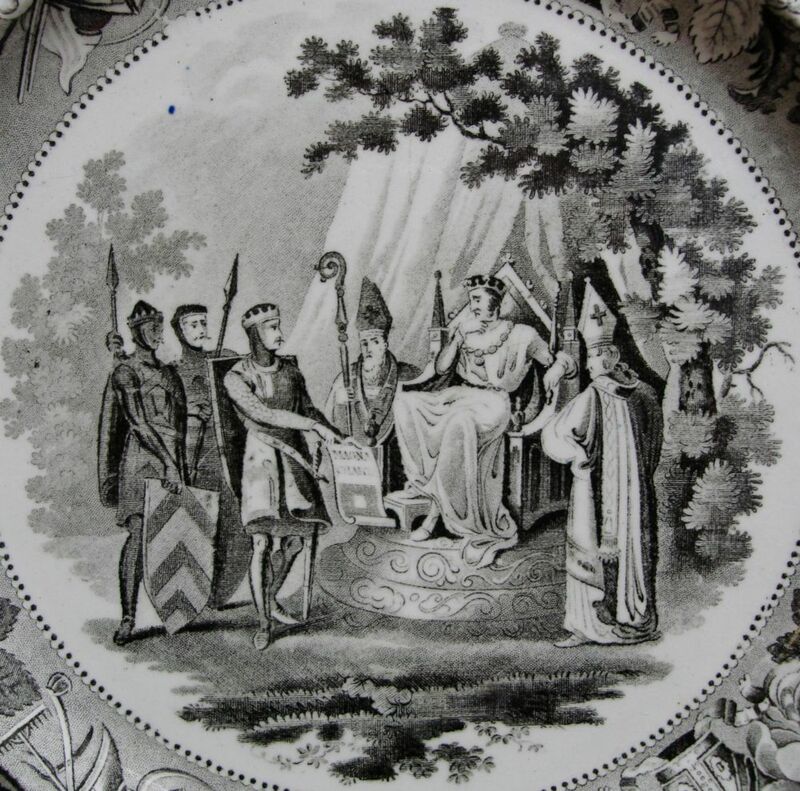 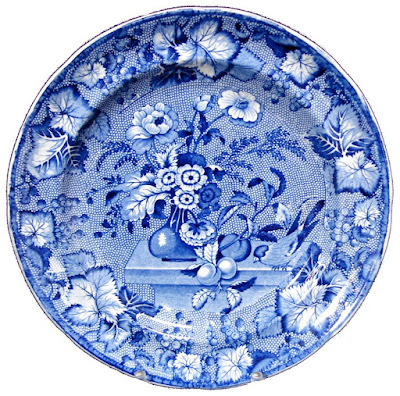 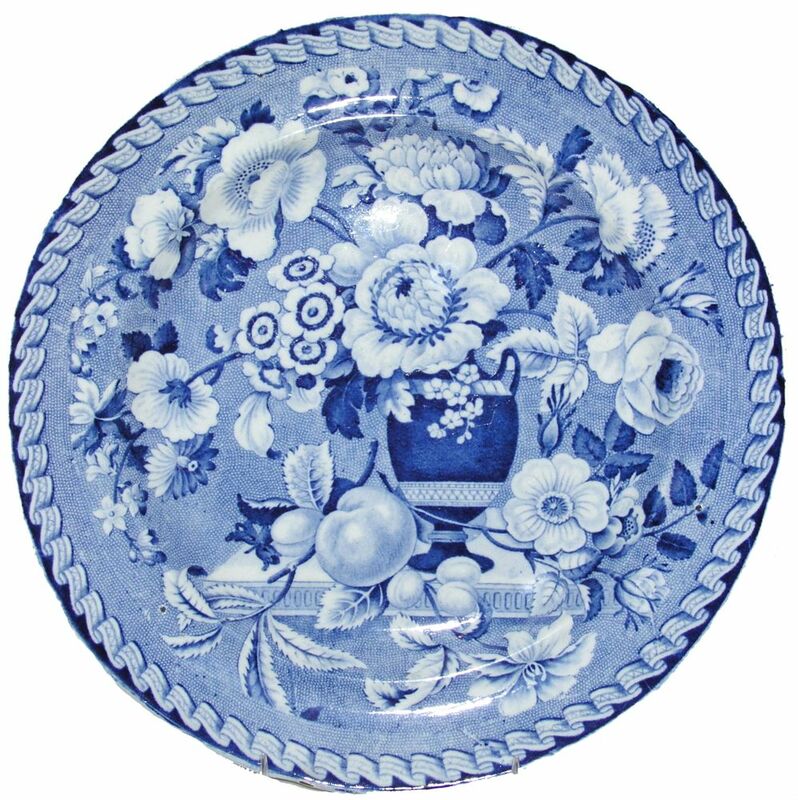 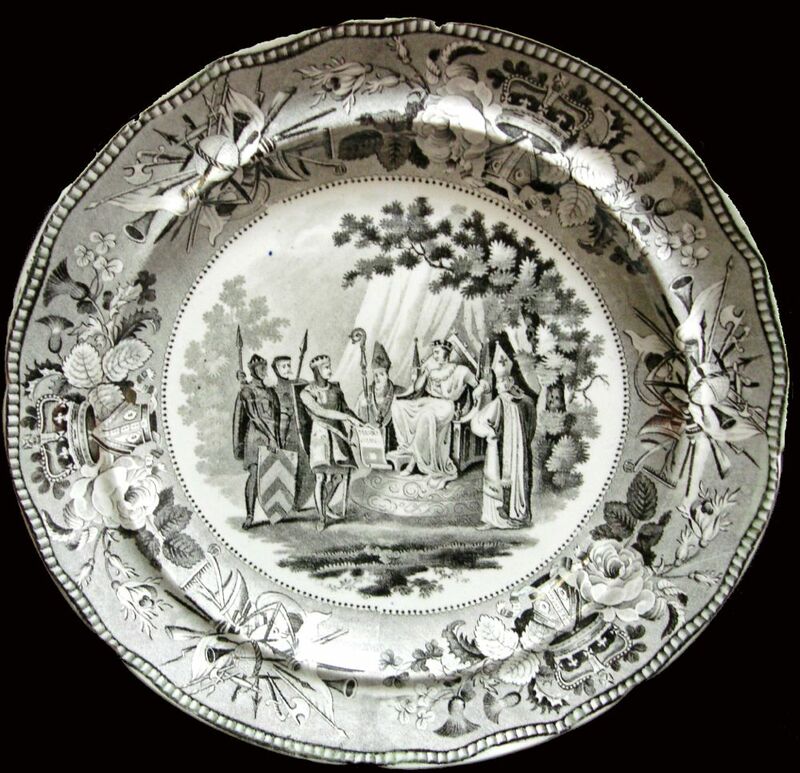 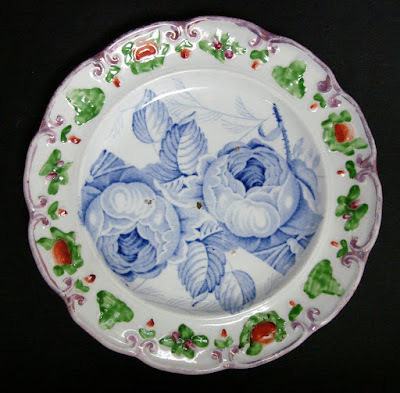 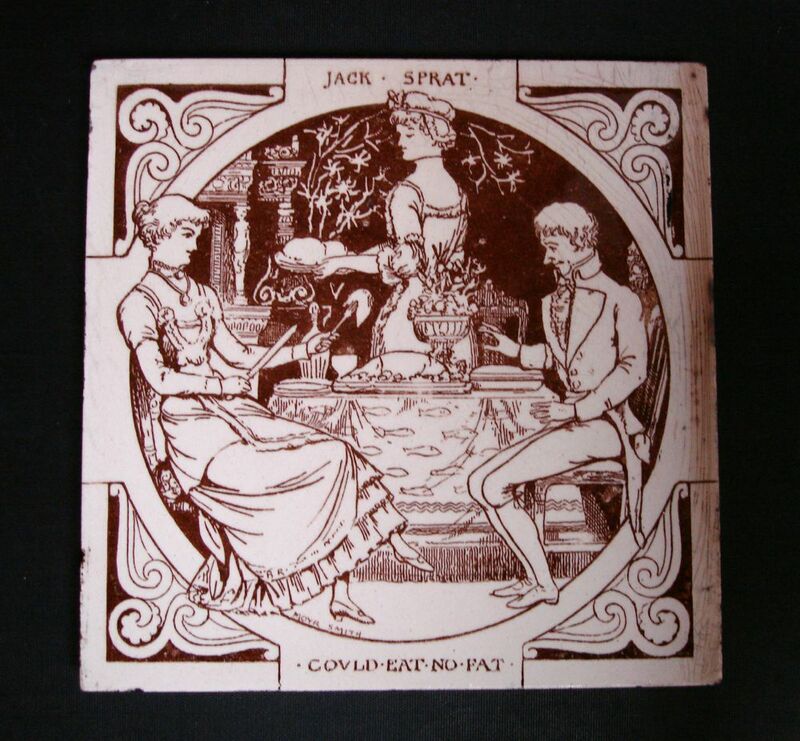 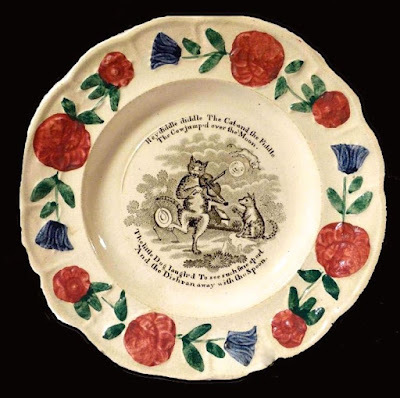 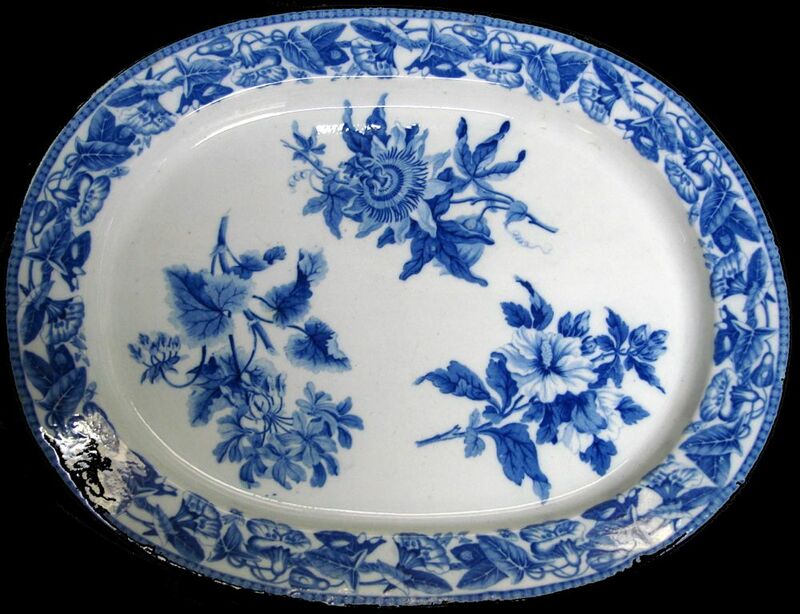 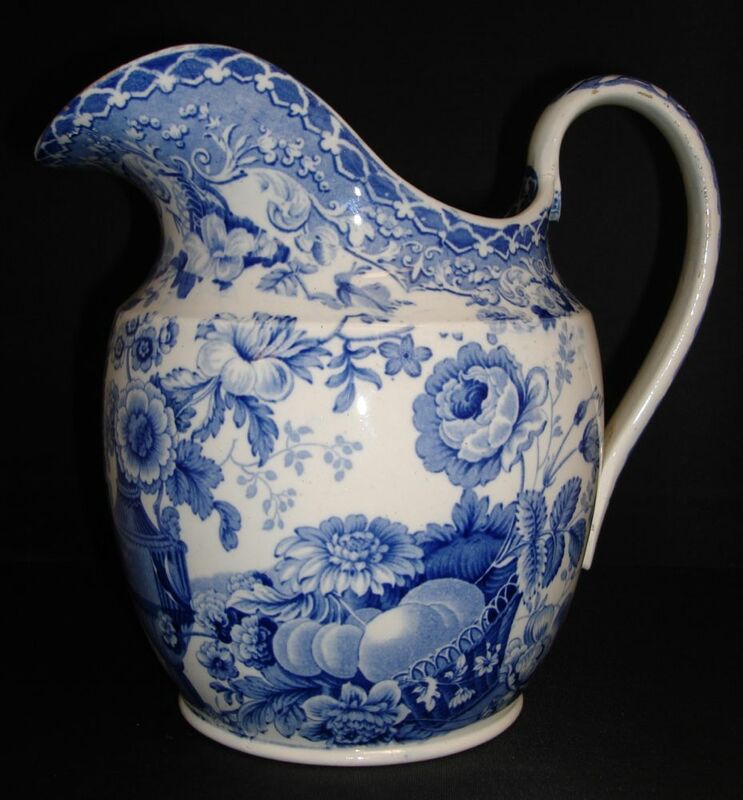 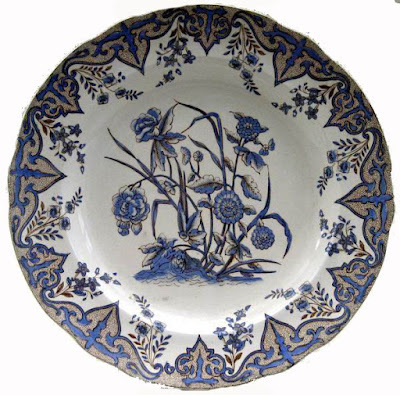 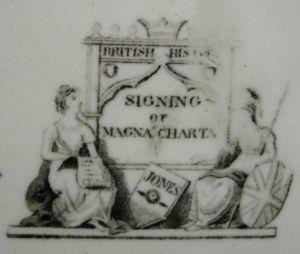 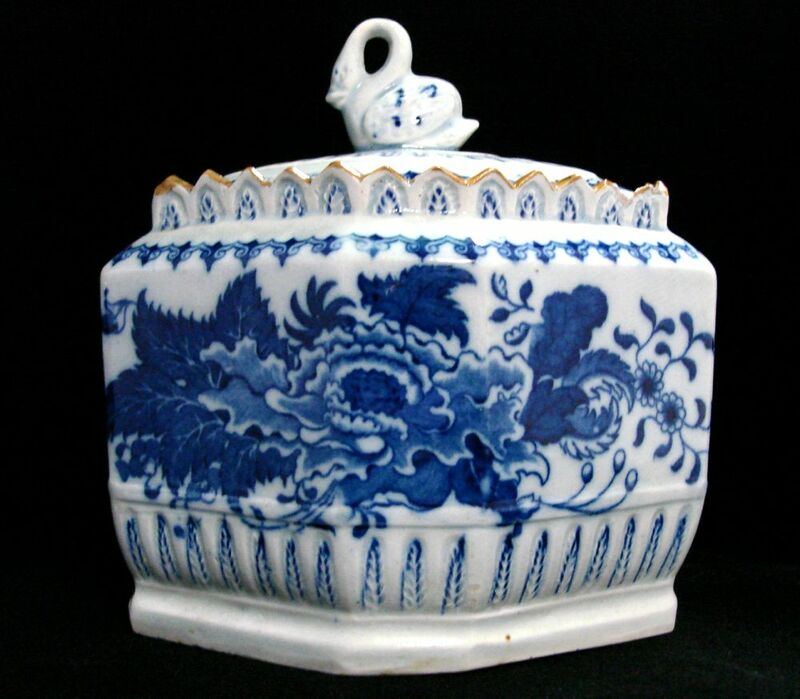 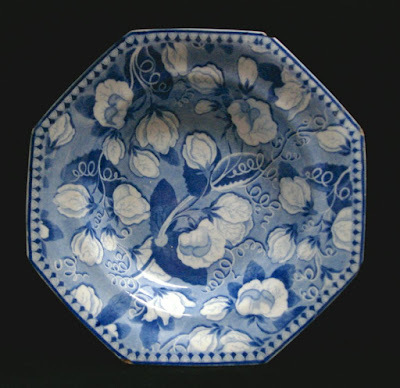 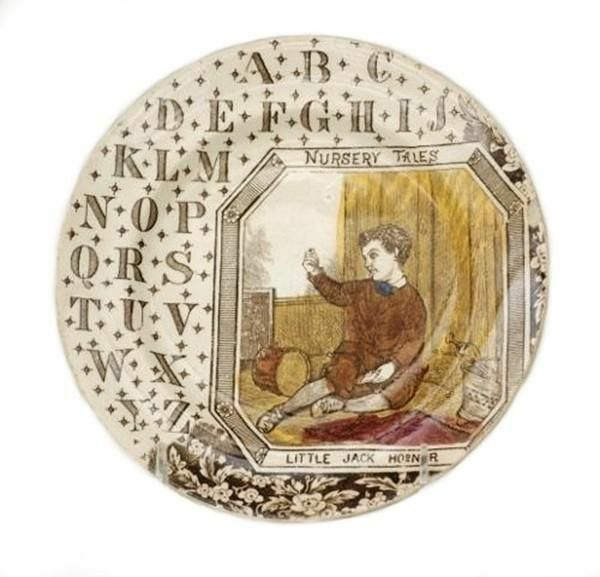 As you know, the English potters capitalized on whatever was popular, so nursery rhymes often feature on transferware patterns intended for children or the nursery. 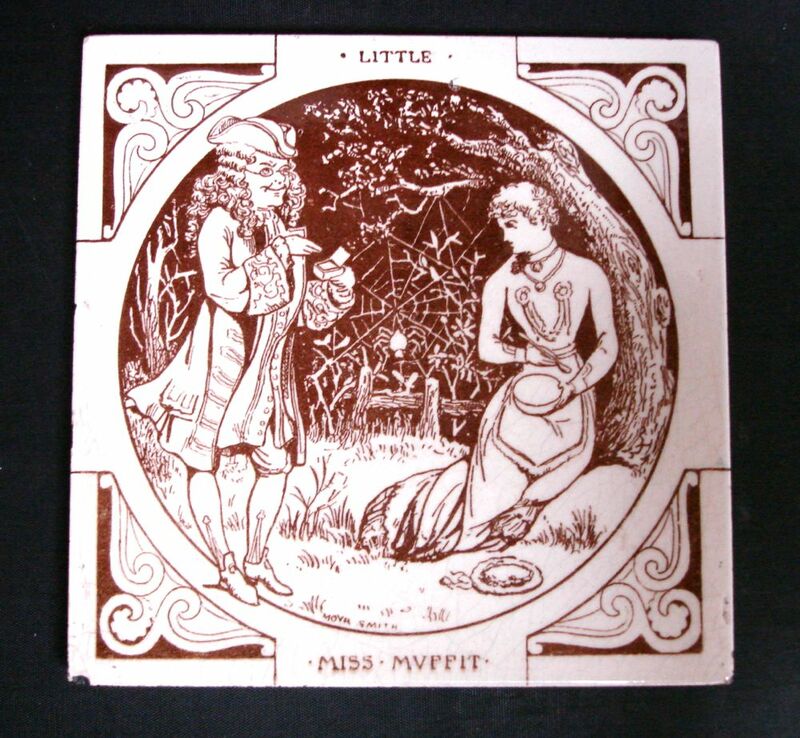 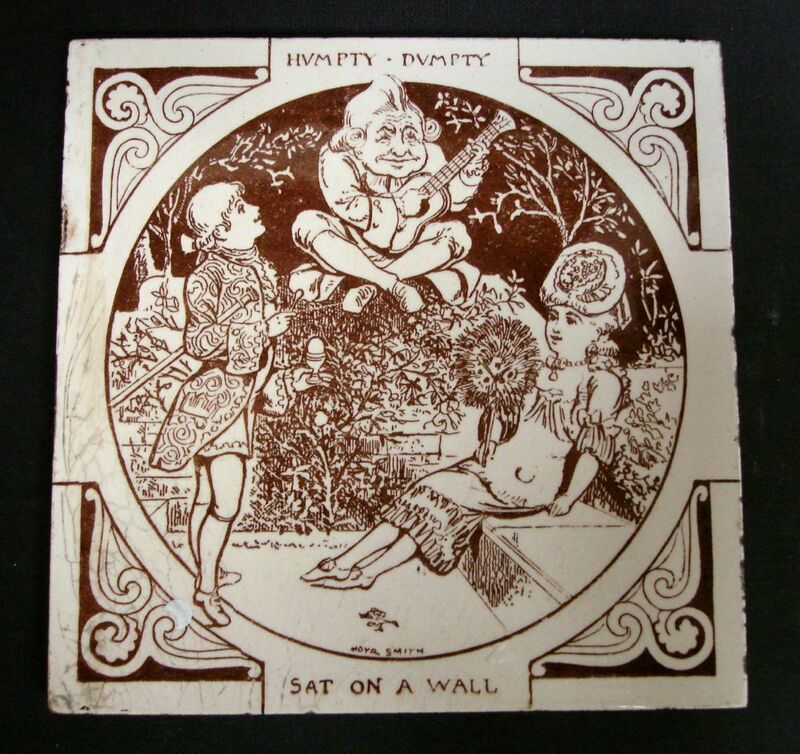 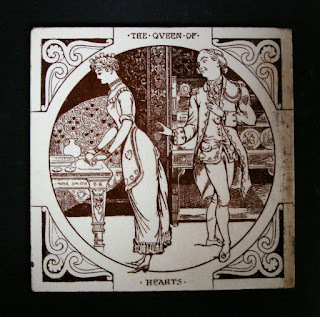 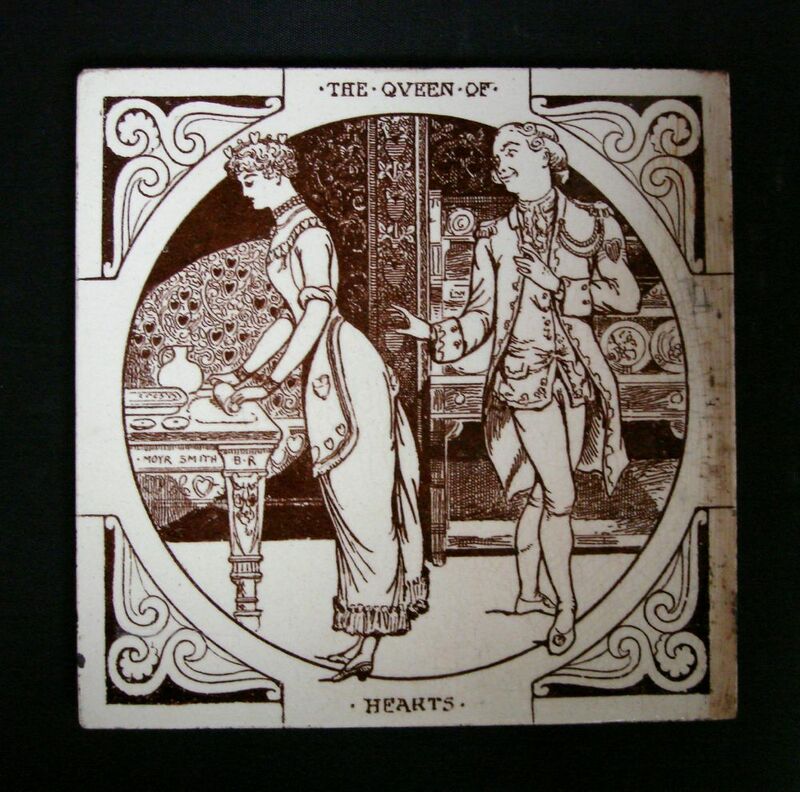 Some of my favorite nursery rhyme patterns were produced on tiles made by Minton Hollins & Co. (1868-1962), ca. 1880. 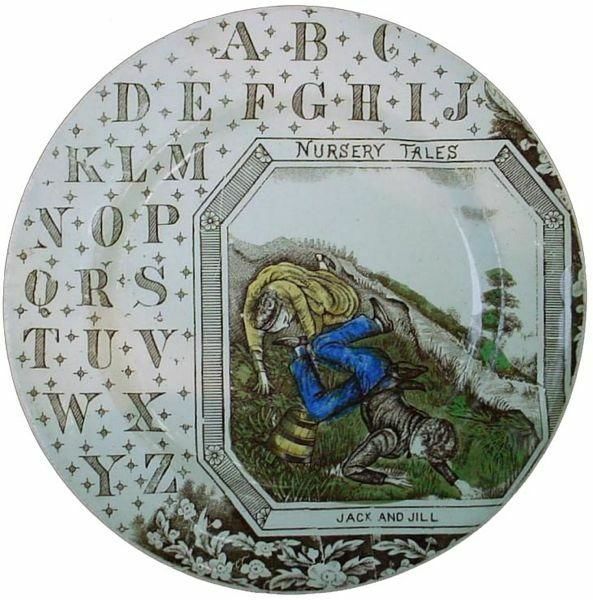 Each one features a different nursery rhyme. It is lovely to imagine a nursery fireplace surrounded by these tiles. 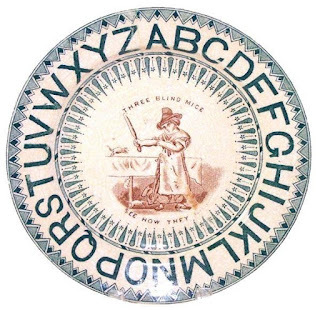 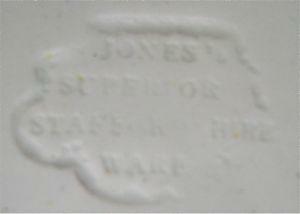 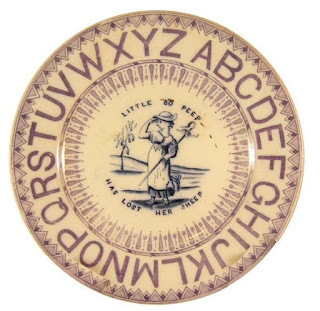 Plates with nursery rhymes sometimes included the alphabet. 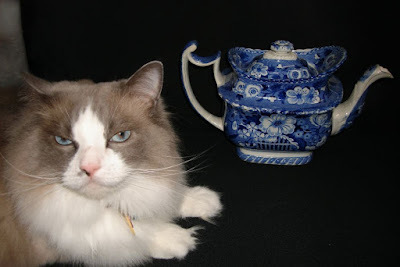 They became both gifts and teaching tools. 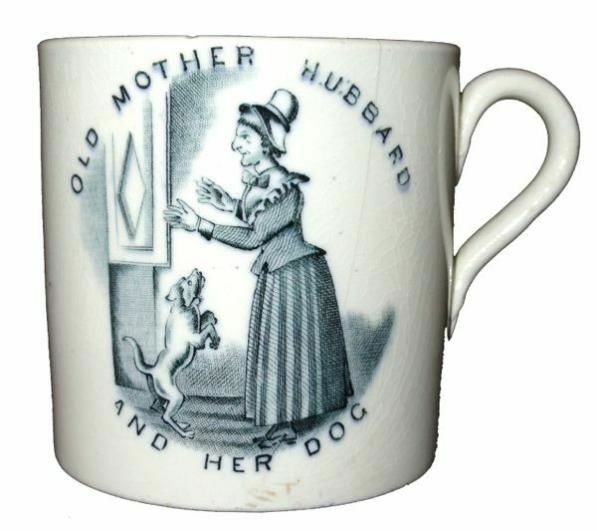 Mugs also showcased nursery rhymes, such as the ones shown here; Little Bo Peep and Old Mother Hubbard. The mug below illustrates a rather dark nursery rhyme; "Rock a Bye Baby." 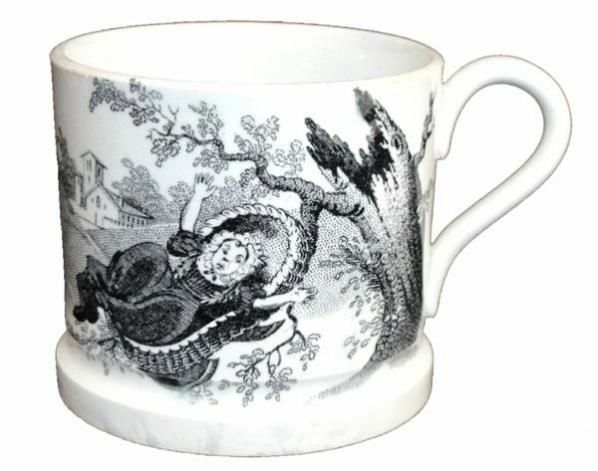 Child's mug "Rock a bye Baby"
"Rock a bye, Baby, on the Tree top/When the wind blows, the Cradle will rock/When the Bough bends, the Cradle will fall/Down will come Baby, Bough, Cradle and All"
I didn't think the words were frightening when I was little. 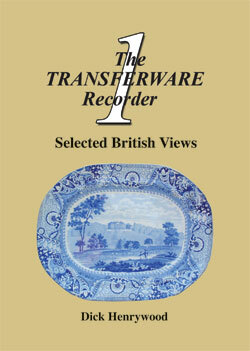 I do now! 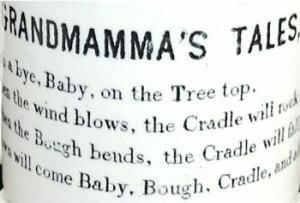 Nursery rhymes can have a dark side. 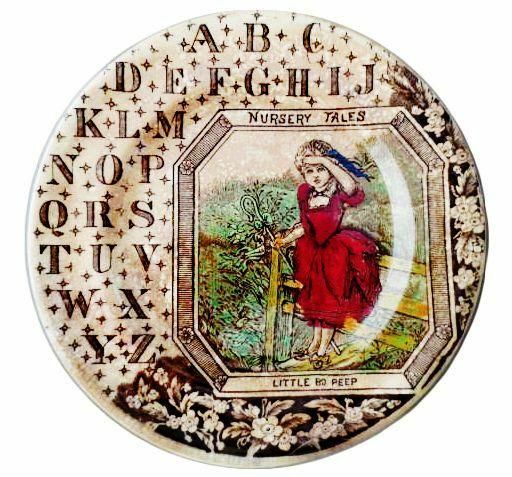 If you want to know the dark side of nursery rhymes, take a look at the website: The Dark History Of Nursery Rhymes. 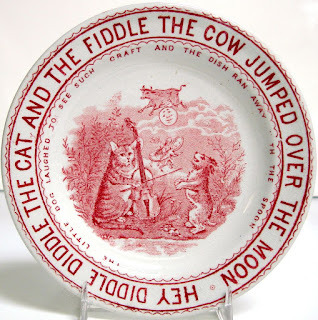 If you are interested in the meaning of nursery rhymes, see Nursery Rhyme Lyrics, Origins and Meaning. Nursery rhymes are usually found in anthologies with the words "Mother Goose" in the title (See some of my favorite anthologies below). 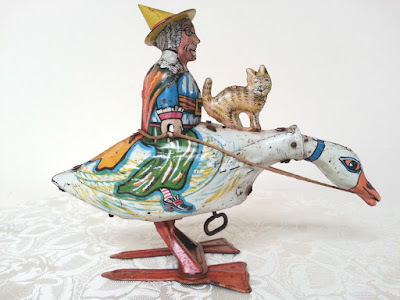 Who was Mother Goose? Was she a real person? Read about Mother Goose origins here. 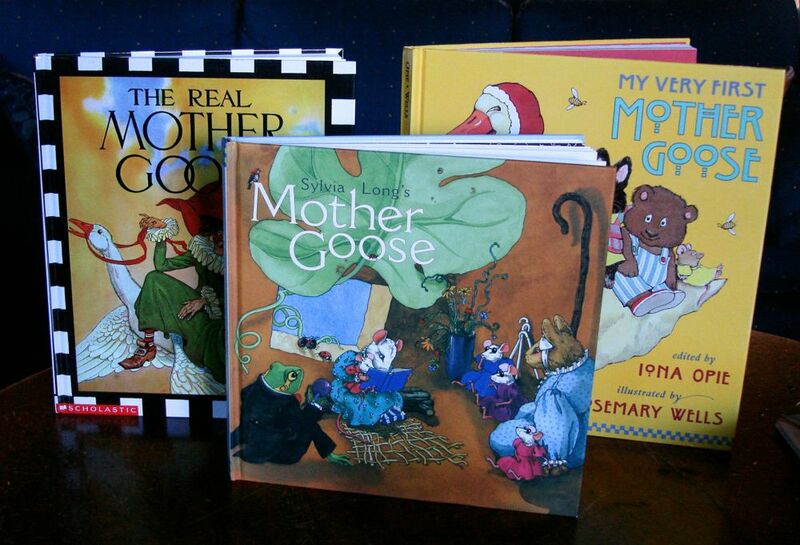 Mother Goose anthologies/Left: "The Real Mother Goose" illustrated by Blanche Fisher Wright, first published in 1916/Center: "Sylvia Long's Mother Goose" 1999, and Right: "My Very First Mother Goose" illustrated by Rosemary Wells. Did you know that nursery rhymes aid brain development in young children? 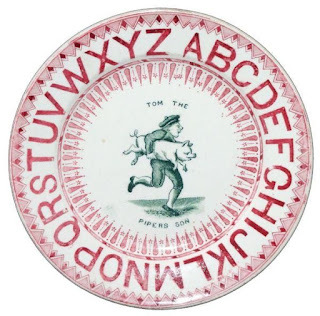 Read my blog post "Cumulative Rhymes On Children's Pottery" here. One more thing. I really love this tin Mother Goose wind-up toy from the 1930s. 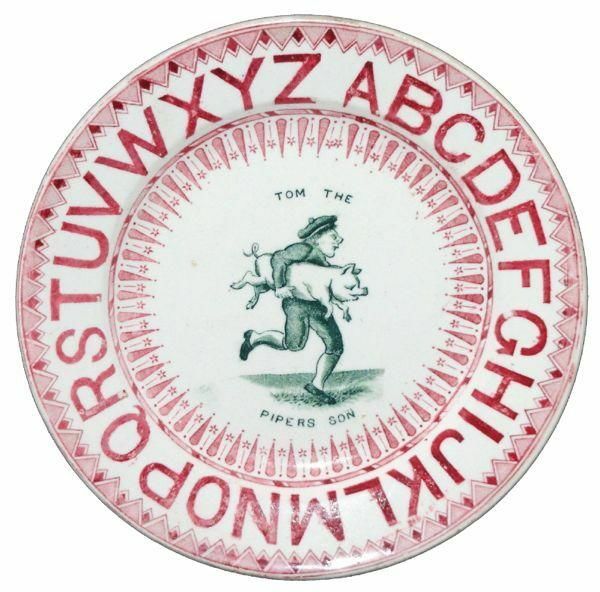 Is Mother Goose a witch? 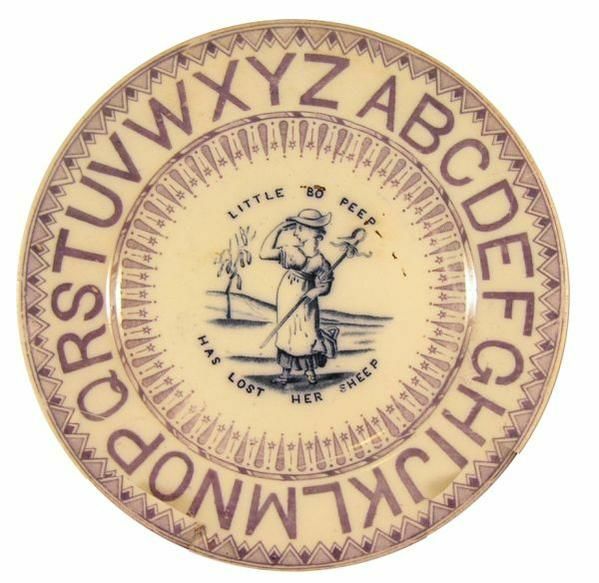 I often wondered, but here the cat and her hat are not black, and I don't see any evidence of a broom (at least not in this version of Mother Goose). 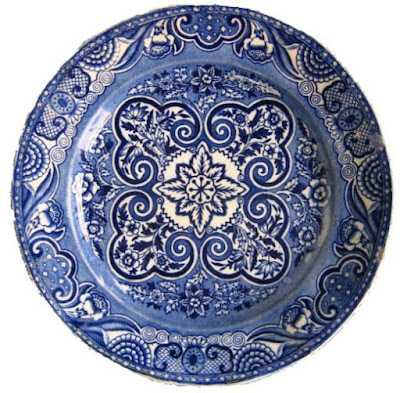 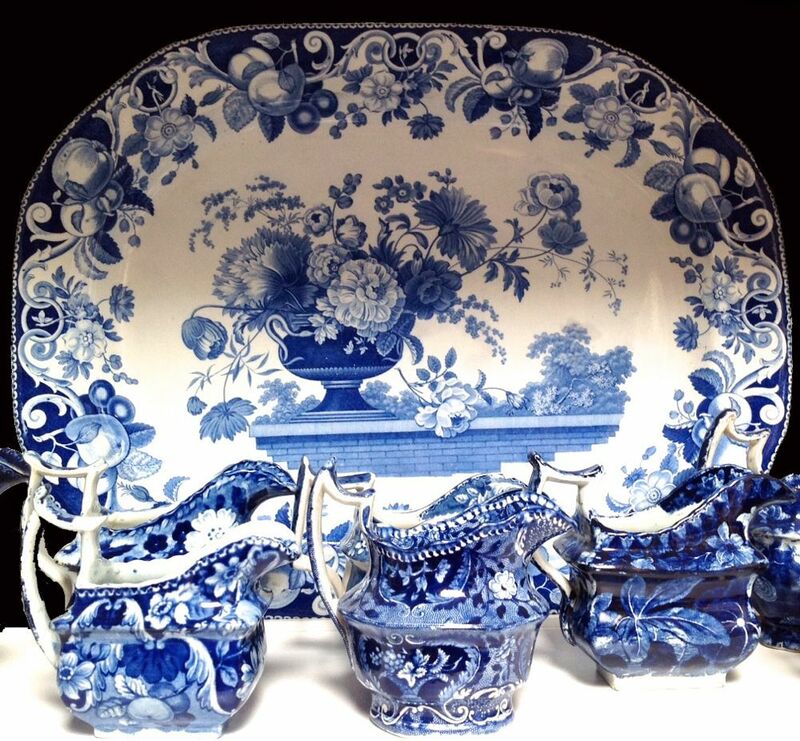 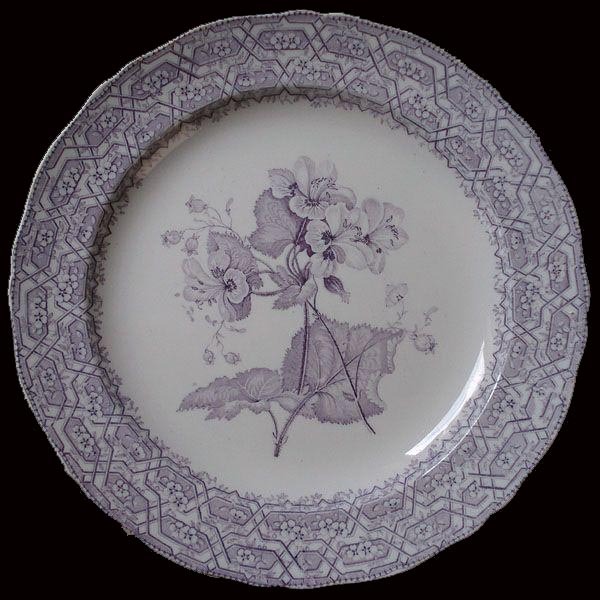 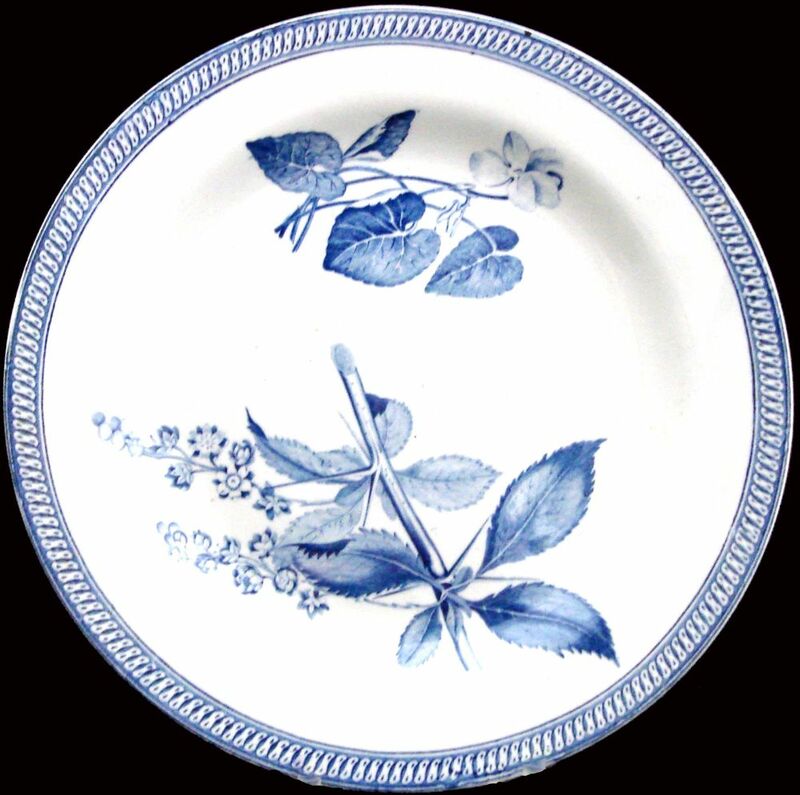 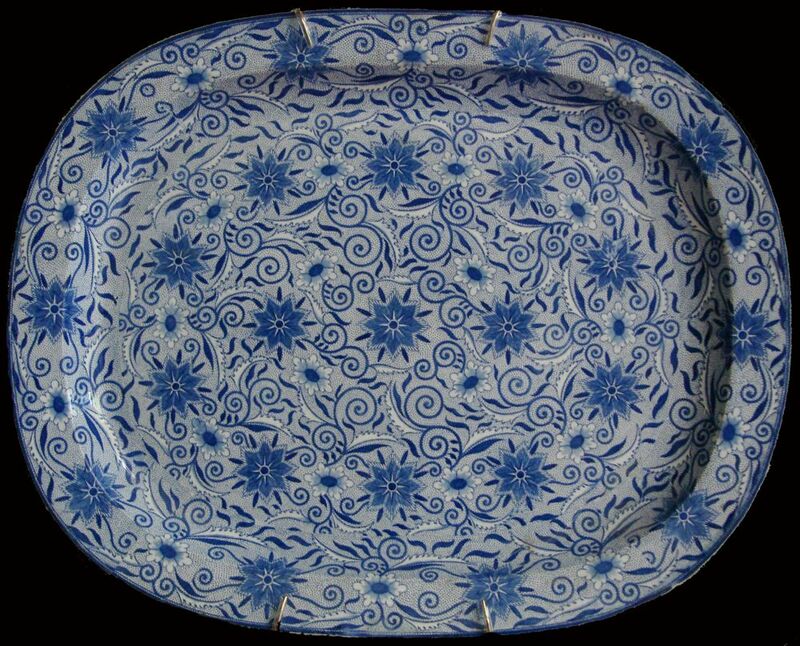 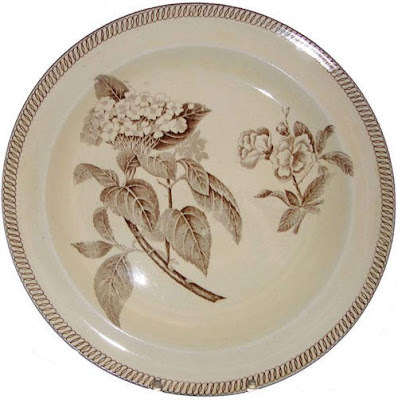 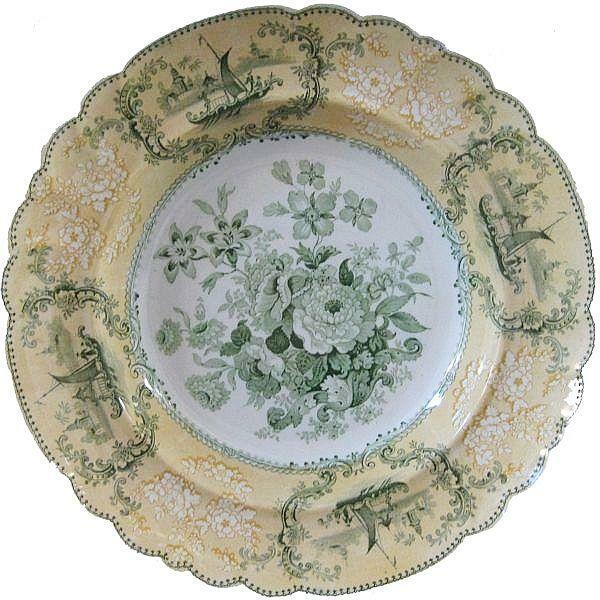 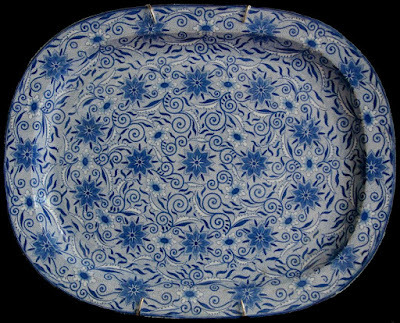 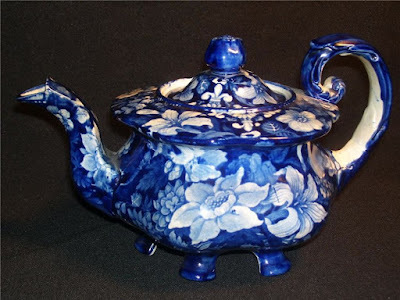 I digress, as usual, so I'll show you some more transferware patterns. Maker unknown "Three Blind Mice"/Another frightening nursery rhyme! 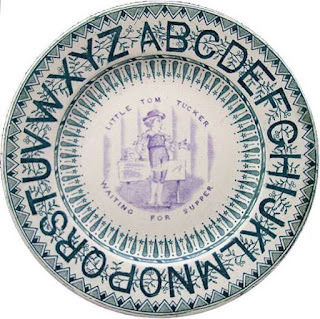 You can see this pattern in my blog post "Inappropriate Or Frightening Patterns For Children." 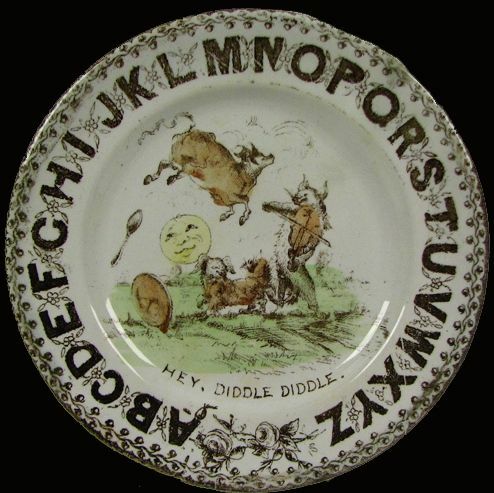 I shall end where I began with "Hey Diddle Diddle." 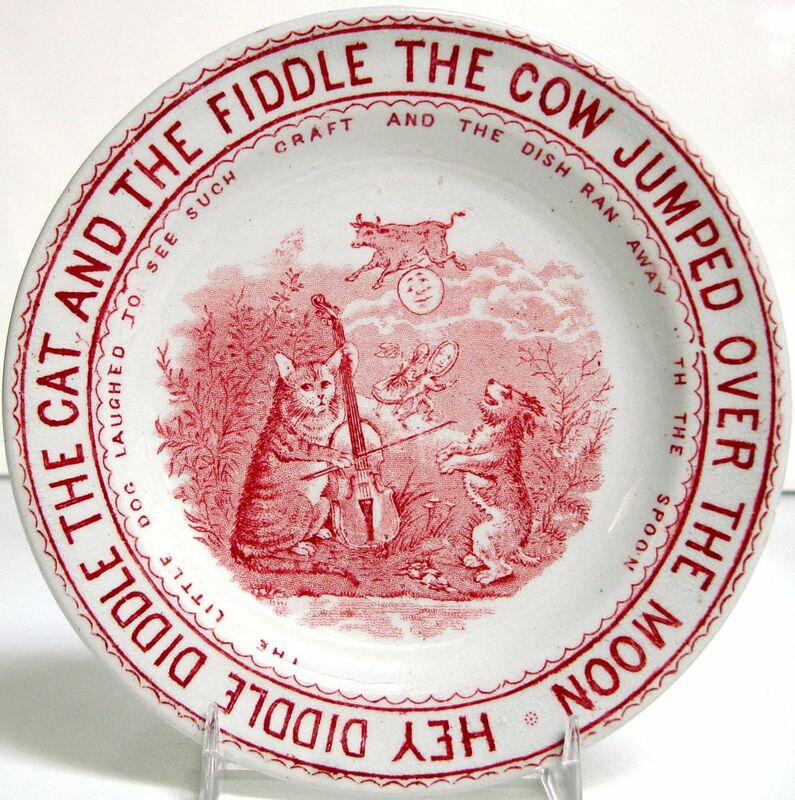 It appears to be a nonsense rhyme. Certainly more appropriate for children than "Three Blind Mice or Rock A Bye Baby!"